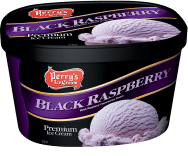 Black raspberry flavored ice cream. 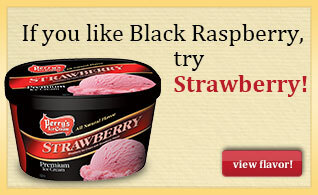 Whether you have it in a bowl or on a cone, it’s the most delicious way to enjoy berries and cream. MILK, CREAM, CORN SYRUP, LIQUID SUGAR, SKIM MILK, BUTTERMILK, BLACK RASPBERRY PUREE (BLACK RASPBERRIES, CANE SUGAR SYRUP, NATURAL FLAVORS, CITRIC ACID), MILKFAT, WHEY, WATER, NATURAL FLAVORS, MONO- AND DIGLYCERIDES, CELLULOSE GUM, GUAR GUM, CARRAGEENAN, DEXTROSE, CITRIC ACID, BEET JUICE COLOR, RED 40, BLUE 1.